As you probably know, in order to be able to store files on a hard drive, it needs to be prepared just right: it needs to be initialized, partitioned, and formatted just the right way. If you've bought an external drive in a store, the preparation has probably been already done by the drive manufacturer. However, what if you want the drive to be prepared differently? 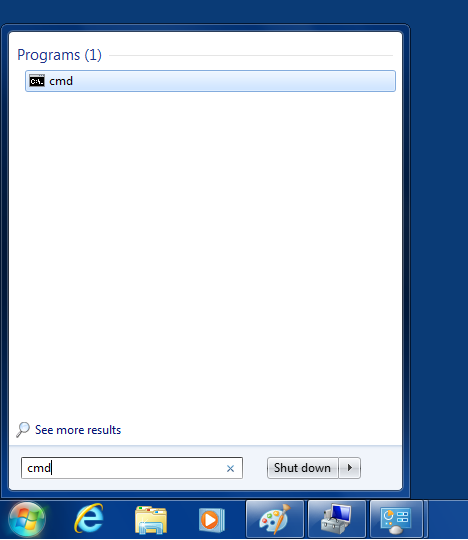 For example, you may want to re-format the drive, or change the partitions that it has. 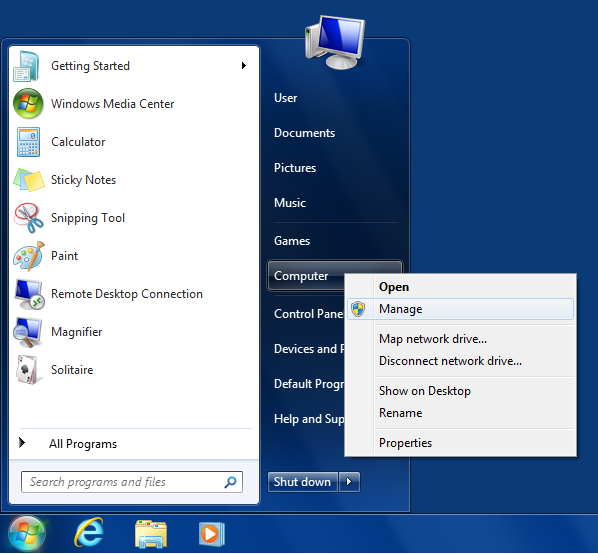 The way to do such tasks in Windows is to use the Disk Management tool that comes preinstalled with Windows. If you use Windows 10, right-click on the Start button, and choose Disk Management from the menu instead. Before you continue, first things first: Disk Management is a very powerful tool, and with great power comes great responsibility! If you are not very experienced with computers, you can look, but better not touch and let someone more knowledgeable to do the job. Because with Disk Management it's very easy to destroy your partitions and lose your files, if you don't know what you are doing. The most important thing when using the Disk Management tool is to make sure you can identify the disk you want to manage in the list. Usually you can do it by the total size of the disk displayed, although it may be confusing. For example, in this example, a hard drive that's described as a 60 GB drive by the manufacturer, is shown to have only 55.89 GB by Windows. (Apparently, the disk manufacturers and Windows have a different understanding of what a "gigabyte" is.) Also, if you have several disks of the same size attached, it may get even more confusing. If in doubt, better unplug all external drives except for the one you actually want to work with, to make sure you are not accidentally erasing data on a wrong disk! 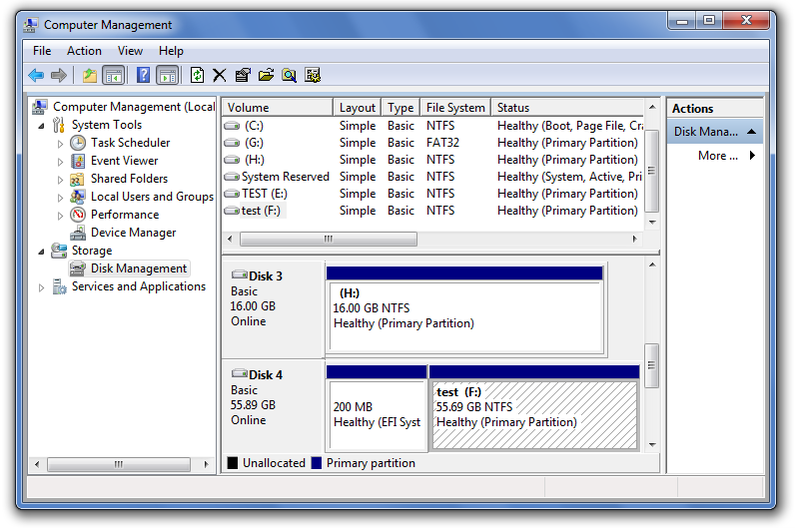 As you can see, the partition is protected in such a way that even the powerful Disk Management tool cannot do anything to it. Note that it's not because the partition is EFI, it's because the tool that created that partition had marked it in a way that prohibits other tools to tamper with it. (That's usually the case for the system hard disks formatted on the Mac computers.) However, what if we want to delete such a partition and re-initialize the disk from scratch? 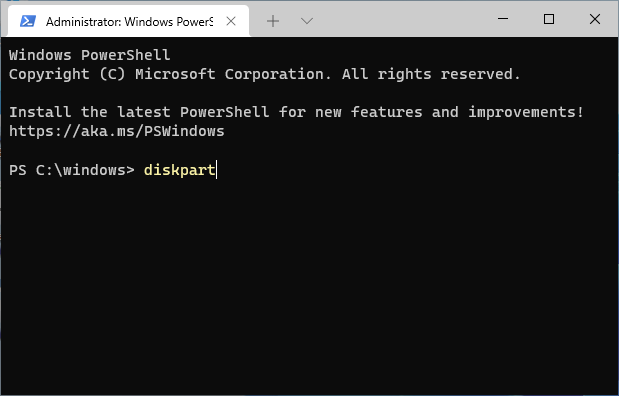 While the Disk Management tool is helpless in this situation, fortunately Windows offers yet another tool, DISKPART, that can do things to the disks that Disk Management can't. The tricky part is, that DISKPART is a command-line tool, that requires us to type commands into its command prompt to make it do what we want. After double-checking that Disk 4 is now selected (it should have the star character * in front of its label), it's time to finally issue the command that will erase everything on the disk 4, including the protected partition. The command that does that is clean. Note that this command erases everything on the selected disk, all partitions, protected or not. If you still have files on other partitions of disk 4 that you want to keep, you should exit now and backup those files, because after using the clean command all such files will be erased without a trace! Note that if you are trying to erase the system disk that hosts the C: drive where Windows itself is installed and running, then even the powerful DISKPART command can't work: Windows simply refuses to erase the drive from which it is running. To erase such a disk, you need to physically remove it from the computer, attach it to another computer as an external drive, and then use DISKPART on that computer to erase the disk.